DMP’s commercial services are specifically designed for the business market. When working together, we fully understand your goals and needs first, then customize our response processing to your unique requirements. Next, our team is trained on your account to assure that our operational procedures align with your expectations. Each specific channel capture process is then documented and tested prior to live production. Armed with a deep understanding of your brand, requirements, and account specifics- the DMP team is then ready to start our engagement. Customer care center (live agent processing by phone or email). 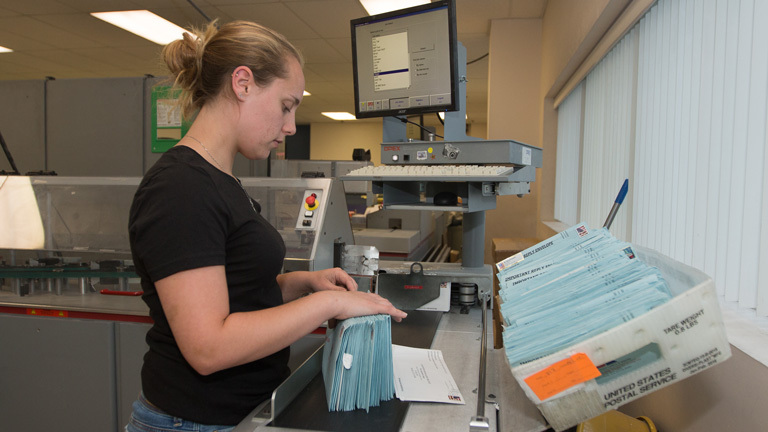 As orders and responses are received, each is carefully processed and stored in a secure environment. When checks and/or cash are collected, they are routed to a special ‘lockbox’ area with additional layers of operational oversight and security. All of DMP’s credit card processing is fully Level 1 PCI DSS-compliant. Finally, for inbound phone or email requests, our friendly staff of customer care center specialists speak directly with customers to process orders thoroughly and efficiently. DMP’s current reporting capabilities feature a consolidated multi-channel summary, as well as detailed data analysis and insights. Report data typically includes order/response rates, source codes, campaign IDs, production stats, and other relevant data. Our reports are flexible and can be easily customized to your specific requirements. We are currently developing an updated, more robust online dashboard and reporting platform with an expected launch in early 2018.